I am interested in human existence; the universe we live in and the way we interact with our reality. I ask the viewer to consider visual white noise, or imagery that is so common and repetitive that it becomes ignored by the intended viewer. Graphics are often generated for advertisements, ticket stubs, video screens, signage, and logos, and meant to convey an idea or introduce recognition. Yet, due to the overwhelming amount of visual information we encounter on a daily basis, decorative images are often scanned and added to the subconscious. This imagery seen by the general population of a city, town, or country can be so familiar that it becomes essentially invisible, yet viewed in a different context, it is powerfully familiar. In this work I focus on the white noise of different geographical regions. I work with pervasive symbols and graphics and use them to create paintings on panels that explore social space as it pertains to different elements of visual white noise. Graphics printed in mass ensure a multitude of viewers, and thereby accompany a society through a period of time. The intent of my inquiry is not to identify pop icons, but to call attention to the impermanent, the multiple and mundane, and the beauty of the everyday image. After selecting and isolating images, I re-contextualize them and invite the viewer to reengage with them. I have focused my intention on two concepts related to human existence. The first is our capacity to move through time and space. The second is the human capability for reasoning, thinking and planning. These two aspects of human nature are revealed in the way we rearrange nature to create objects or environments. In my work, I compose a surface which the viewer enters with their own physical and intellectual understanding of space and time. I use mixed media to create movement, line and form on paper. 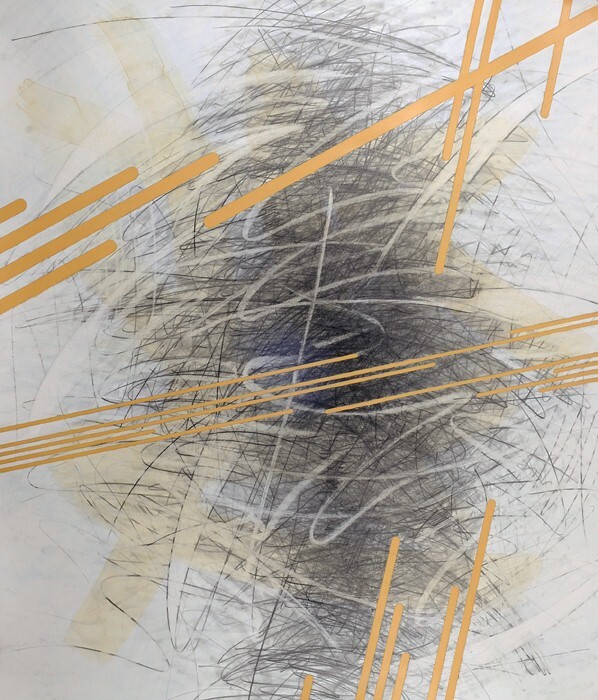 Some forms are drawn with the aid of tools or stencils while others are created by gestural marks; each sets up a relationship to surfaces and edges. The structured forms or lines drawn with tools are used to give a sense of a controlled and planned outcome linked to the thinking side of human nature. The gestural artist mark is used to reference the movement of the body through space and to capture a moment of that action in time. Together these forms and lines also activate the illusionistic space that extends beyond the picture’s edge. The viewer is thereby presented with two possible realities; that of the illusionistic space and that of the viewer’s space. This process begins a dialog about movement and space and its relationship with the viewer.